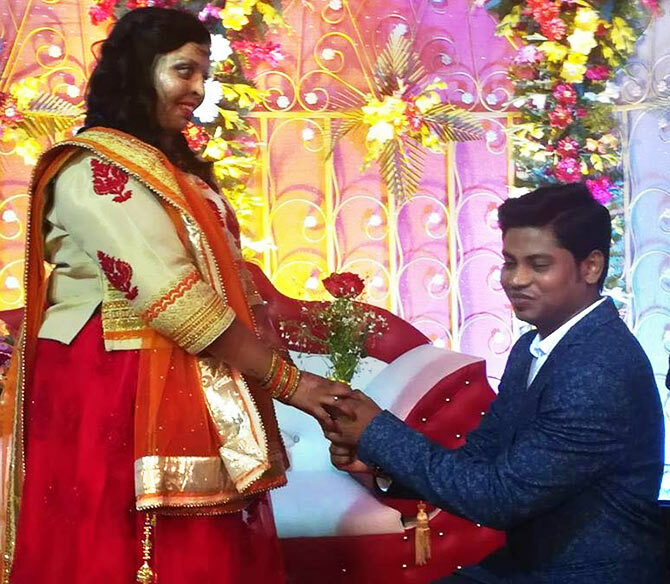 Pramodini, 25 who was attacked by a spurned lover, got engaged to her fiance, Saroj Sahu, 26, at Sheroes Hangout Cafe, Lucknow. February 14, Valentine's Day was special for this new couple. 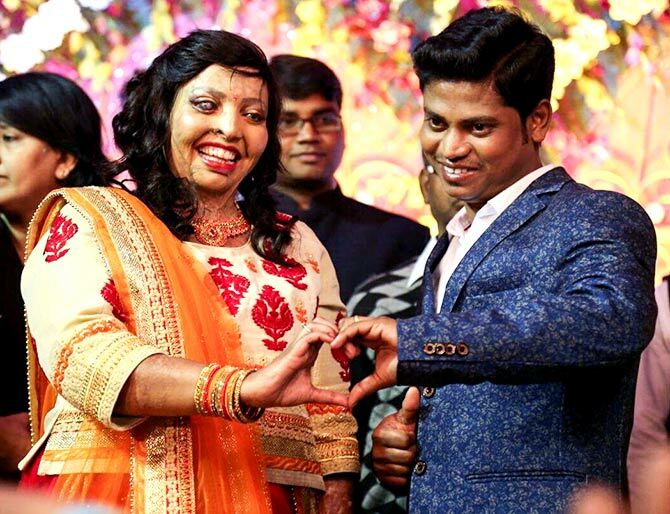 On this day, Pramodini, a 25-year-old acid-attack survivor got engaged to her longtime friend. 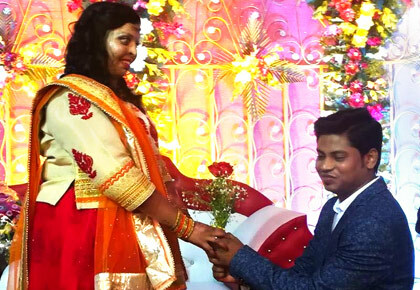 Pramodini, who likes to be addressed as Rani, got engaged to her fiance, Saroj Sahu, on Wednesday in Lucknow. The duo's love story is nothing short of a movie sequence. The couple met when Rani was undergoing treatment after surviving an acid-attack. "I was critically injured in the attack on that fateful day when I was returning from college after appearing in an examination. I had to be taken home from the government hospital where I was admitted after nine months as the family had no funds for treatment,' Pramodini told PTI. In 2014, she was introduced to Sahu, a medical representative by profession, through a nurse who brought him to see the problems the young girl was going through. Sahu decided to support and help Rani heal her emotional and physical scars. "He even quit his job to stand by me during those trying times," Pramodini recalled. All was not roses in the love-story. The couple faced opposition from Sahu's friends and family. Gaurav Prakash who witnessed the event, wrote: "The brave girl Pramodini, who survived the terrible acid attack finally got her prince charming Saroj who stood firmly with her in her terrible weak moments , and now they come together as one forever! God bless both and our best wishes, specially to Saroj who remained firm like a pillar of strength and positivity and supported Pramodini through her tough times! Tough times never last, tough people always do." Back in 2009, Rani was attacked by a spurned lover in Jagatpur, Odisha, which resulted in her suffering 80 per cent burns and partial loss of her eyesight. She got in touch with campaigners from 'Stop Acid Attack' team who helped her go on in her life, as normally as possible. 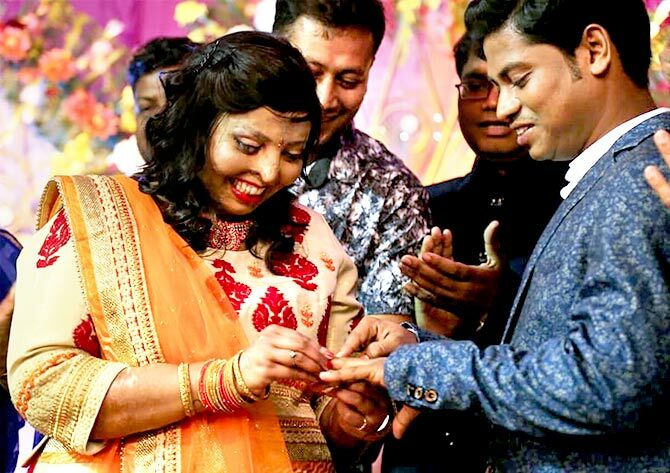 The couple got engaged at 'Sheroes Hangout Cafe', which is run by Stop Acid Attack campaigners and provides employment and support acid-attack survivors. Pramodini and Sahu plan to return to Odisha and help run a 'Sheroes Cafe' to give employment to acid attack victims. Watch: Milind Soman reveals how to be a great boyfriend!